Hume’s ethics reverses cause and effect in respect of values and emotions. Emotions do not determine values (as Hume held they did); values *trigger* emotions. Our emotions tell us nothing about the facts, they only tell us what we *feel* about our evaluation of the facts (or what we think are the facts). In order for what we think are facts to actually be facts we must ourselves be *rational*, which means, we must take an objective approach to choosing our values. The only objective approach to identifying anything, including values, is to hold reality and reason as the only absolutes. This close connection between value and emotion, which is easily observable, led Hume to conclude that value judgements are merely expressions of emotions. He was mistaken. A quote comes to mind here: “Vanity does not wish to pay. Pride does not wish to owe.” ~ Francois de la Rochefoucauld. There is a false dichotomy you create. It is not a circle if you include non-financial/non-material values in the equation when two people ‘trade’. Every interaction between rational men imports *some* value by the very fact that they are rational. This other value is a spiritual one (by spiritual I mean ‘pertaining to consciousness’, and includes a man’s moral character and/or his knowledge). All facets of value pertain to life (and specifically, to the life of a rational man), since life is the only objective standard of value. Values can be material or spiritual. In some transactions, what a man lacks in material value in the trade, he makes up for by his spiritual contribution. In the case of a loan without sufficient collateral, a spiritual contribution is in fact the only contribution a borrower makes toward the ‘trade’ to start with. Hume mentions neither emotions nor values in the passage I quoted. When he speaks of “passions” he means desire, and when he speaks of “judgment or opinion” he means belief. Can you translate your Randspeak into English? It would help a lot if you were to rephrase what you’re trying to say in terms of the belief-desire model of folk psychology. The connection between money and how it helps us to achieve our values is automated in our minds (but first had to be understood and accepted by our reason). So when we identify a $20 note is or may be our own, our emotional response relates to the idea that our values may be achieved if we were to acquire that $20, or conversely that our values may be lost if were to lose that $20. As for your request for a translation to Humespeak, I will come back to you shortly. “Passion” is the visceral component of “emotion.” Thus, in this context, they are limitedly interchangeable. Passion/emotion are natural responses to an object or event which interacts with a man’s ACTUAL value system — not the value system he THINKS he holds, but the value system he ACTUALLY holds. Most men are not self-honest to the extent that they have any conscious grasp upon their actual values — they tend to consciously hold such values as they think they should have, without ever analyzing which ones they actually have and why. In this sense, emotions are always entirely rational (unless the subject suffers from some physiological mental disorder). As to when human interests clash; in the vast majority of cases, these situations resolve themselves through an analysis of property and self ownership. IOW, if I gain no benefit from interacting with someone, I will simply choose not to do so. And I will not steal, because, to a truly rational person, stealing is not consistent with self-interest. There is nothing which is more valuable to the man of reason than his soul. It is the key to his psychological and spiritual well-being. No amount of concrete engorgement may compensate for it. On what basis do you come to this conclusion? I submit that the term ‘passions’ in the 18th century and as Hume used the term in The Treatise had a similar meaning to what is meant by emotion nowadays. As evidence, Nathan Bayley’s 1756 Universal Etymological Dictionary defines ‘Passions’ as “any motion where the soul is carried toward any thing; or the agitations of it according to the different objects which present themselves to the senses; the affections of the mind, as love, hatred, fear joy”. Also, looking at today’s etymological dictionaries, in the 18th century ’emotion’ referred to a sense of strong feeling, and only expanded to include all level of feeling in the 19th century (i.e. after Hume’s death). In other words, for Hume, a passion was a type of emotion, while emotion was the word used to refer to any affective disturbance of the mind. Sentences in The Treatise such as “there are certain calm desires and tendencies, which, though they be real passions, produce little emotion in the mind” make sense only when the 18th Century definitions are understood. Like many philosophers of his time, Hume developed a theory of the passions—that is, the emotions—categorizing them and explaining the psychological mechanisms by which they arise in the human mind. His most detailed account is in Book Two of the Treatise. So, when I write that values trigger emotions, in Humespeak I am saying that values trigger the passions, where by “values” I mean those things that one holds (subconsciously) as being important to one’s life. Again, on what grounds do you conclude this? I submit that Hume does not mean ‘belief’, rather, he means evaluation, a word that first entered the english language in 1755, 15 years after The Treatise. 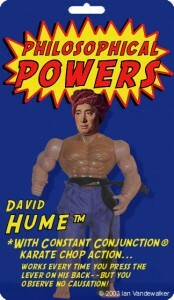 Now, you have claimed Hume to be the greatest philosopher in history. What is the standard you use to come to that conclusion? “‘Tis not contrary to reason to prefer the destruction of the whole world to the scratching of my finger.” ?? I think the debate here is missing the main point to Richards Blog post, which is that Rand spends a great deal of time laying down her own opinions and insists they are Rational, and that anyone whom denies her reasoning is definitively irrational. And then claims the only moral imperative is that a Man is faithful ‘to reality’. Yet this ‘Reality’ is merely ‘an impression’…. The reflected light as seen through her own lens. It is in no way Objective reality. And as Richard has pointed out that objectivists who buy into her Charade, they then proceed to make the absurd claims that all her ‘cherry picked’ assertions are definitively objectively arrived at and thus Rational… and thus correlate perfectly with her supreme moral imperative! A completely arbitrary/subjective and circular enterprise! This is subjectivism vs subjectivism, not Objectivism vs subjectivism. Both Socialist Statism and Objectivism claim ‘Human flourishing’ to be the desired end. They only argue about the means. They both rely on Human opinion as to what roll the Government ought to play in achieving the desideratum. They both conveniently deny any ‘Higher Law’ than their own Genius. I say ‘conveniently’ because a Higher law would get in their way… cramp their style… because they would no longer be free to make up the rules as they like. Reality is what they each say it is… what they want it to be…. both agree that Reality is Dead and that this being so, they have perfect freedom to formulate their own ethics, and politics to achieve their conveniently eloquent ideal of ‘Human flourishing’. Who in their right mind could doubt such a Noble vision? Who could claim that such atheists are without scruple? The whole business is a fraud! The denial of Objective morality. Man as God… His own Lawgiver. Both are divorced from reality. We see a tiny piece of it, and deduce as much as we can about it. This is the ONLY means available to us to understand reality. And it is precisely this decisiveness that is off-putting to her critics. I don’t always agree with her. But on this particular point, I am in complete agreement with her ideology. “[Ayn Rand] claims the only moral imperative is that a Man is faithful ‘to reality’. In other words you agree that what is “impressed” upon our minds via perception are the impressions of reality (not some illusion), making those impressions absolutely and undeniably reflective of that which is real. Using our reasoning we can understand the nature of those impressions – like understanding indentations in a mold, and using concepts/logic construct an accurate picture of reality as it really is. Beliefs and desires can be expressed as propositions. E.g., I believe that I cannot afford to go on holiday. I desire that I can afford to go on holiday. Folk psychology posits beliefs and desires to explain behaviour, in this case money-earning behaviour. Why did I work extra hours? So that I could afford to go on holiday. But, please, let’s stick to the main point of my post which is that standard accounts of rationality are means-ends accounts and that Rand’s account of rationality is non-standard. According to means-ends accounts of rationality, ends (i.e., values, desires, passions, emotions, affections, etc.) cannot be criticised as irrational (except in the two senses Hume describes). Only means can be criticised as irrational. Not at all. If what I most wanted, what I most desired, what I most valued was the destruction of the whole world, then, given the opportunity either to destroy the whole world or to scratch my finger, it would be irrational in the extreme to scratch my finger. To scratch my finger would be to “chuse means insufficient for the end.” I should have pushed the history eraser button instead. Mrs O’Connor solves nothing. She doesn’t even understand the problem. The problem is that an ought cannot be deduced from an is. Hume didn’t invent the problem, he merely highlighted a simple fact of logic. Desire may be *a* passion, but it is certainly not synonymous with ‘passions’, as you have claimed it is. By your logic, ‘shed’ would be synonymous with ‘buildings’. While I accept that ‘belief’ is a synonym of ‘opinion’ or ‘judgment’, it is only so in a certain sense. I submit that ‘evaluation’ is a more correct synonym for ‘judgment or opinion’ than ‘belief’ is (in the sense Hume used those words). You substitute verbs for nouns here. To be accurate, you shoould have written: “My belief is that I cannot afford to go on holiday. My desire is to be able to afford to go on a holiday.” Now, using Hume’s terminology it would read: “My judgment is that I cannot afford to go on holiday. My passions is to be able to afford to go on a holiday”. The first sentence reads okay, but the second makes no sense at all, proving my point that ‘passions’ is not synonymous with ‘desire’. “My evaluation is that I cannot afford to go on holiday” would be a better replacement for “My judgment…” because that word eliminates the possibility that you ‘believe’ merely because of a hunch or a guess, i.e. That you have in fact given proper consideration to the matter and used reason to arrive at your conclusion. Identifying a person’s psychological motivation for acting is not the same as identifying an ethical system that is based on an objective standard which people should refer to before they act. I submit only according to those who subscribe to the idea that the practical and the moral are dichotomous. Ayn Rand demonstrated that the moral *is* the practical, if one is objective. Is it not that one of those senses critcizes ends as being irrational, namely where: “a passion, such as hope or fear, grief or joy, despair or security, is founded on the supposition or the existence of objects, which really do not exist.”? A-la Ayn Rand, chosen ends that are evaluated as not being life-affirming can most certainly be criticized as irrational, since to choose life-destroying values would be by logical implication to choose to destroy one’s capacity to value. To value anything requires by logical necessity that one value the state of living from which values are made possible. … you would be irrational to the point of being a mad-man, because you are (by logical implication) desiring most is the inability to desire … you are valuing most the inability to value … you are living with the sole purpose of dying. In other words, you are trying to manifest a life that is a contradiction, which cannot be done. Yet Ayn Rand identified the “simple fact of logic” that without life there can be no ends, and so all value-seeking entities by logical necessity (implicitly) value life with each and every action they take. Life (not “God’s word”) is therefore the ultimate value upon which all other values depend, which is why life is an *objective* standard of value (the only one). Life – and specifically, man’s life – is the standard against which all of a man’s chosen values should be evaluated in order for those values to be considered objective and reasonable. It is thus that a man may derive what he ‘ought’ to do from the fact of what he ‘is’. Rand’s ethics are as per the old line that they are both good, and original. However the good parts are not original, and the original parts are not good. You claim in it Ayn Rand held that “If you endanger your life to save a stranger, you are immoral.”, while ignoring the fact that she stated explicitly that if the risk (i.e. the endangerment) were minimal, then it *is* moral to save their life. In other words, she is stating that one *should* endanger one’s life to save another, provided that endangerment is minimal. Endangerment is a sliding scale term and so one must assess the risk to oneself to determine if the danger is minimal or great. Even firefighters do not recklessly put themselves in danger, and it is their job, so, why are you arguing for a morality that would put innocent bystanders in great danger? The fact is that your scenarios misinterpret what she wrote and then apply the ethics incorrectly, dropping context along the way. If the man who plunges in after the drowning stranger can barely swim, has a family of his own, and knows he has a great chance of dying in the attempt to save the stranger, then yes, the reckless endangering of his own life would be immoral. If however he has just been diagnosed with terminal cancer and has 6 months to live, and he has worked for 10 years as a lifeguard when he was younger, then it would be perfectly moral for him to attempt the save. The point is that it is up to each individual to assess their own situation against an objective standard of value: their own life. To claim, as you did, that a crowd subscribing to Objectivist ethics would applaud the tragic and unfortunate death of an innocent person is ludicrous and shows your ignorance about Objectivist ethics and/or how to apply them. Objectivist ethics upholds life as the ultimate standard of value. Can you name another standard of value that can be demonstrated logically to be essential to the act of valuing? Thought not. To lose any man’s life, whether by his own will, that of another, or accidentally, is tragic and a loss for every individual. Any ethic that would *compound* any loss of life is pure evil. The ethics of altruism (per it’s original meaning) does just that. And is why Miss Rand is against it. Objectivist Ethics do promote heroism, but not at the price of stupidity. when I wrote… “Rand spends a great deal of time laying down her own opinions and insists they are Rational, and that anyone whom denies her reasoning is definitively irrational. …. I regret using the term ‘impression’. I was more concerned about Rand’s un-objective ‘interpretation’ of what reality is (rather than the problems we have regarding the medium of our senses) … Ie The outside world as it appears to her having passed through her biased/ sloped ‘Knowledge filter’ which blinds her to reality. I don’t have time to expand on this now, yet I will return to it is the next few days.